Shakespearean workshops, delivered by Adey Grummet (singing) and Rebecca Guyver (art), focused on Shakespeare in art and music. Children from Langham Primary and Bishop William Ward Primary Schools made soundscapes, learned new songs, made Shakespearean portraits and designed books. Emma Bishton was our accompanist. The art work produced was put on display at the Shakespeare Concert. We worked closely with these schools, offering opportunities for young people and teachers to work alongside professional musicians. You can find out more details about the Pimlott Foundation’s work with young people here. We recently hosted a workshop at Suffolk One in Ipswich with Tetra, who recently performed as part of the Pimlott Foundation events programme, and a group of sixth form students. Tetra are Phoebe Pimlott, Alice Trocellier, Tom Norrington and Thomas Jacob, a musical group born out of a love of early music. We were recently excited to lend East Bergholt High School our Gamelan for a day of in-school musical workshops. If you are a school, music group or community group and would like to borrow our Gamelan please get in touch. Pimlott Foundation is running a musical theatre workshop that gives participants the opportunity to workshop and perform an excerpt from the show ‘Wicked’. It will be led by Lisa Roberts, who teaches at Colchester Institute (BA course in Popular Music, Rockschool, and the Extended Diploma in Popular Music). Below are some videos from the workshops. Following the success of the Pimlott Foundation’s Hansel and Gretel project, many young people (and parents!) said they would like to sing together again. With this in mind, we worked alongside Colchester Arts Centre, and organised two singing workshops, which were then followed by a rehearsal and a short concert for elderly residents at Colchester Arts Centre. Find out more about the Hansel and Gretel Project here. Sign up to our newsletter to keep up to date with our latest projects and events or get in touch to find out more. On 9th October, 150 students from One College, Suffolk New Academy, Hadleigh High School, East Bergholt High School, St Alban’s Catholic High School, Tendring Technology College and Thomas Laud Audley School, met together to participate in a choral workshop directed by Christopher Borrett and Oliver Ruthven. Students studied ‘Adiemus’ by Karl Jenkins, and a medley of songs from ‘Les Miserables’. ‘Just wanted to say that I was so incredibly impressed with the standard the group of students doing the choral workshop managed to achieve in such a short time. It really was quite phenomenal. Thank you so much for allowing us to come and listen. It has been the highlight of my week’ – a member of the audience. ‘Carnival of the Animals’ Day at Firstsite Gallery. 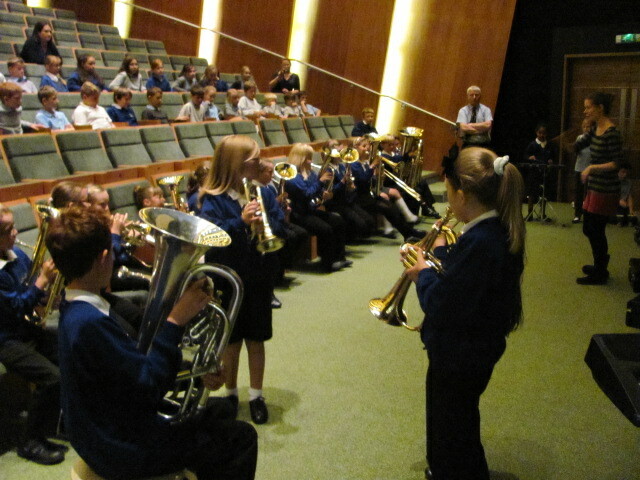 Pupils from Langham, Stratford St Mary, Chase Lane and Bishop William Ward primary schools, worked with professional artists and musicians to compose songs, create works of art and learn music from ‘Carnival of the Animals’ by Saint Saens, in preparation for a live performance of the work at The Mercury Theatre. 5 primary schools – Boxted, Stratford St Mary, Bishop William Ward, Langham and East Bergholt primary schools met in Boxted Church, to be entertained and inspired by local young musicians from Ipswich School and Chase Lane Primary School. We finished the concert with a Benjamin Britten song –‘The Night Song’ from ’The Little Sweep’, in which the pupils were the birds, and Daniela Bechly sang the story! Langham, Bishop William Ward, and Chase Lane primary schools joined us in Old House Barn in June, along with Hannah Roberts (bagpipes and ukulele), Lottie Carey, Max Raven (piano) and Daniela – and treated us to songs, recorder and brass music. Christopher Borrett worked with music students from Suffolk One, and delivered workshops dealing with song writing and composition. The day event at held at Suffolk One , involved theory and practical work. Lois Hinsley and Amy Mallett, teachers at Suffolk One, supported the day. At Boxted Church Langham Primary, Boxted Primary, Stratford St. Mary Primary, Bishop William Ward Primary with Ipswich School and other young soloists demonstrated their musical skills and explained their instruments.